Stretch marks (striae) appear when the skin is stretched quickly most commonly due to weight gain and pregnancy. Stretch marks are usually found on the abdomen, breasts, upper arms, legs, and buttocks. These marks start out to be red or purple in colour eventually fading to a Silver/White or grey. 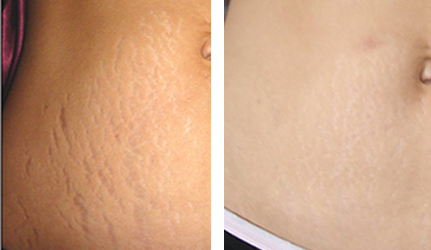 We have found that chemical peels are one of the fastest ways to remove/reduce stretch marks. We have also found the skin be tightened rather effectively when combined with Radio frequency (RF) skin tightening. buttocks and legs to stimulate collagen production. The benefits are pain free, smooth skin, tighten and regenerate the skins collagen without injections, surgery or downtime.